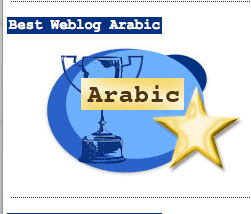 Arab bloggers nominated for the annual Best of the Blogs award (The BoBs) are pulling all the stops, to attract more votes. The contest, organised by Deutsche Welle for the sixth year, has entered its final round. More than 8,400 blogs were submitted by 58,837 users for 17 categories and a jury, made up of seasoned bloggers from around the world, selected 187 finalists. (Disclosure: I am one of this year's judges). Now that the judges work is almost over, it is the turn of the online community to support the finalists through a month-long online voting process, which ends on April 14, 2010. The jury will then meet face to face in Berlin, and the results will be announced on April 15 during re:publica. The shortlists consist of 11 entries in each category. In the Arabic category, the competing bloggers are as follows: Syrian Medad, Jordanian Osama Romoh, Moroccan Noaufal, Syrian Abdulsalam Ismael, Libyan Ghazi Gheblawi, Egyptian Tarek, Egyptian Jimmy Halim, Algerian Yousef, Bahraini Suad, Moroccan Mustafa Elbakkali and Egyptian Wael Abbas. سألني صديقي عن عدد زوار مدونتي فأخبرتهم بأنهم “أصبحوا تسعة”؛ رجلا أمن يسهران على فك طلاسم التدوينات وكتابة تقارير منظمة عنها لحماية الشعب من أمثالي، وصديقة تود لو تحبني لو استطاعت لولا دمامة وجهي وصغر عيناي، وثلاثة آخرين تآمر غووغل على إرسالهم إلى مدونتي بالخطأ لا يكاد يمرّ يوم دون يشتموا غووغل وصاحب هذه المدونة لضياع وقتهم الثمين جداً أونلاين.. أما الأخير فلا أعرفه..!! تفاجأت بأن مدونتي بلغت المرحلة الثانية من مسابقة البوبز في فئة “افضل مدونة عربية” إلى جانب مدونة عبد السلام عبر إحدى التعليقات الأخيرة في هذه المدونة، ولم أكن قد رشحتها هذه السنة بل قام أحدهم بفعل ذلك ووضع على كاهلي عبئاً آخر، والحقيقة استغربتُ كيف أن هذه المدونة وصلت إلى المرحلة الثانية على الرغم من أن الشبكة مليئة بمدونات مذهلة ذات محتوى خصب وعميق أخجل أن أضع تعليقاً فيها لضآلة ما أشعر به أمامها. A friend asked me about the number of visitors to my blog so I told him that they have become nine: “Two security officials who stay up all night decoding the riddles of blogging and writing organised reports to protect the people from those like me; a friend who wishes she could fall in love with me if it were not for my ugly face and tiny eyes; three others with Google sends by mistake to my blog, and who don't let a day go by without insulting Google and the owner of this blog for wasting their time; as for the last one, I don't know him!! I was surprised to see my blog shortlisted in the BoBs for best Arabic blog, alongside Abdulsalam's blog, and found out through a comment here. I did not nominate myself but someone else did, placing a huge burden on my shoulders. I am surprised to see my blog get to this level when the Internet is full of amazing blogs, with rich content and deep thoughts, which make me ashamed to even leave a comment on them because of how minuscule I feel. * المصوّتون من الأرياف سيحصلون على “تنكة زيت” بلدي مكفول بالإضافة إلى سي دي CD بلاي ستيشن مجاناً. * المصوّتون من المدن يحصلون على خمسين دولار موزمبيقي (كنت أودّ لو أجعلها دولار أمريكي لكني معارض للولايات المتحدة وأسلوب تعاملها مع القضايا العالمية بشكل عام لذلك استعضتُ عن عملتها بالدولار الموزمبيقي)..
* العائلات التي تصوّت لصالحي دفعة واحدة تحصل على “هدية العائلة” وتتضمن كيس من الأرز والقهوة والشاي وجهاز لابتوب لا يعمل (ليس المهم أن يعمل فلن تعرفوا استخدامه على كل حال)..
* مستخدمي الانترنت والمنتديات الفنية العاطلين عن الفعل في مقاهي الانترنت سيحصلون على ديفيدي DVD كمبيوتر فارغ لتسجيل البرامج التي يقومون بسرقتها من النت.. مجاناً. *Those who vote for me from the rural areas, will get a canister of oil, in addition to a free CD for the PlayStation. What should I say? I promise to buy – should I win – all those who votes for me a car .. made out of plastic. Today I call upon you, through this post, to vote for my blog in the BoBs (If you see that it deserves being the best Arabic blog). I also urge you to start your own blogs and to reach out to the rest of the world through blogging, either about issues or topics which interest you. Yesterday I was voting for Khubaiza, today my blog is shortlisted and perhaps tomorrow, it would be your turn. لا أدري إن كان من اللائق أن أدعوكم هنا للتصويت لمدونتي دون سواها, ففي النهاية المسابقة تعتبر فرصة ذهبية للتعرف على مدونات جديدة من مختلف أنحاء العالم. لذلك فأنا أدعوكم للذهاب لموقع المسابقة و محاولة التعرف على المدونات المرشحة و إنتخاب تلك التي تعتقدون أنها الأحق بالترشيح, و إن كنت طبعا أتمني أن تنصب تصويتاتكم لصالح مدونتي. I don't know if it is appropriate to ask you to vote for my blog and not others. At the end of the day, this contest is a great opportunity to get introduced to new blogs from around the world. This is why I am asking you to go to the site of the contest, try to get to know the nominated blogs and vote for the one you believe deserves this nomination. And if my blog deserves it, I would be delighted if you could vote for me. From the blogs, the campaigns have spilled over to Twitter and Facebook, with the nominated bloggers and their fan base urging readers to cast votes. Some bloggers have even designed and posted logos on their blogs, calling upon their readers to vote for them. To cast you vote for any of the blogs nominated for the awards, click here.